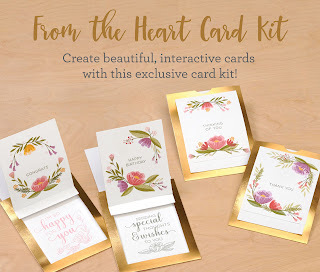 The exclusive From the Heart card kit gives you all the materials you need for creating 12 interactive cards, including an E-size stamp set with heartfelt sentiments and stamps you can layer together for exquisitely artistic cards. Available only during September, this card kit is a must have that will help you create elevated artwork from the heart. The From the Heart card kit can be yours for FREE when you become a Consultant in September or when you host a qualifying party.